we are pleased to bring you another of the great Ebony Records compilation albums. Ebony Records was one of the classic minor-league labels of the NWOBHM time, focusing on up-and-coming mid-eighties bands mostly from the UK, though a few Euro bands crept in as well. 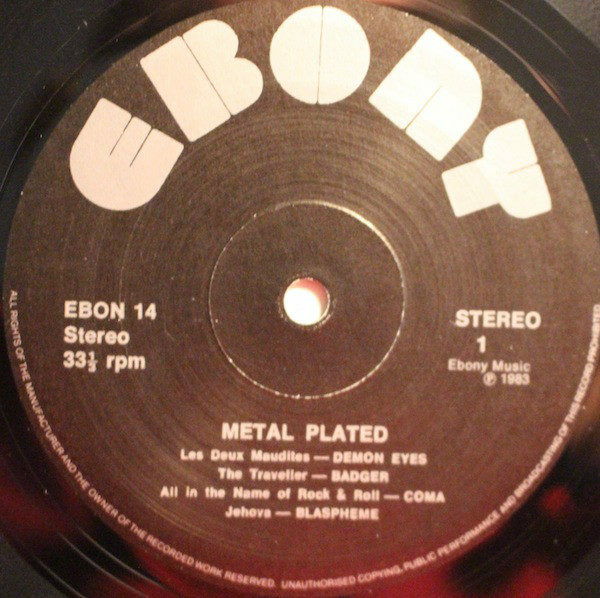 Similar to labels such as Metal Blade, Ebony started out releasing compilations of unsigned acts, a few of which went on to record albums with the label. This particular album is “Metal Plated” from 1983 & features eight bands in all, including four from the UK : BADGER, COMA, DOUBLE AGENT & STALLION, three from France : DEMON EYES, BLASPHEME & VULCAIN, and from Sweden, STEEL WINGS. If you’ve enjoyed any of the previous Ebony comps or N.W.O.B.H.M, you’ll dig this too. (Demon Eyes, Badger, Coma, Blaspheme, Vulcain, Bouble Agent, Steel Wings, Stallion). A1. DEMON EYES – Les Deux Maudites (France)…Hammering Metal, into your head! The energy tops the lack of originality. 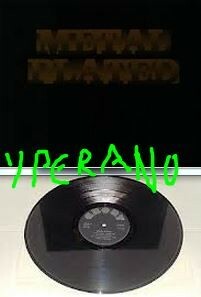 Different to “Rites Of Chaos” LP version. A2. BADGER – The Traveller (UK) Some decent twin guitar leads makes this slightly better than your average Rock-Metallers. A3. COMA – All In The Name Of Rock’n’Roll (UK) Sounds like those early Saxon r’n’r cuts. A4. BLASPHEME – Jehova (France) Perhaps their greatest song ever, here in a superior version to the one on their s/t LP. B1. VULCAIN – Vulcain (France) Frances very own Motörhead cloning better than few have cloned before. Or after. B4. STALLION – Don’t Wait Too Long (UK) In parts hauntingly similar to early Motley Crüe. Decent Hard Rock. 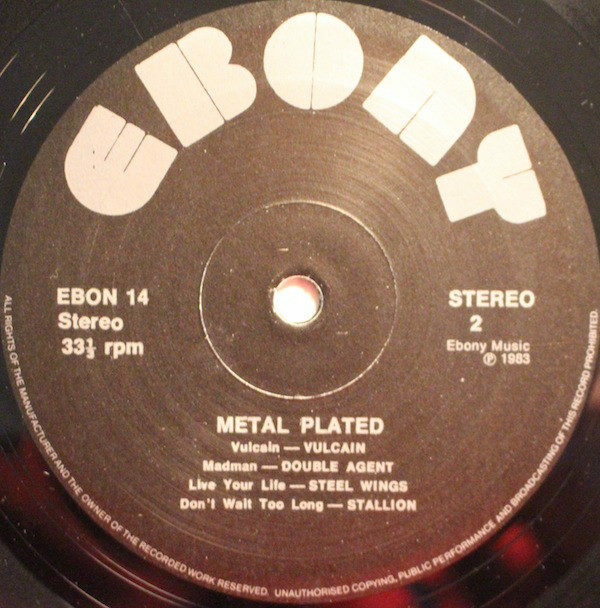 Ebony Records was one of the classic minor-league labels of the NWOBHM time, focusing on up-and-coming mid-eighties bands mostly from the UK, though a few Euro bands crept in as well. Similar to labels such as Metal Blade, Ebony started out releasing compilations of unsigned acts, a few of which went on to record albums with the label (one notable band that did appear on a comp but later went on to bigger things on another label was Mercyful Fate). Many of the releases were produced in-house by label founder Darryl Johnston, giving several of the albums a similar low-budget style that nevertheless was part of the charm of the NWOBHM period. A lot of the bands released one or two albums. There were a few gems in there, including Savage classic Loose ‘n’ Lethal, while the biggest band to emerge from this label would almost certainly be Grim Reaper, who were snapped up by the major label RCA on their way to a successful worldwide career.